KFEA is an association which has been formed by Korean flutists who have passions for setting up more practical and meaningful flute education culture. Now, KFEA has 12 Executive Directors, 40 Directors, and about 800 members. The members include distinguished soloists and principal chair holders intop-classorchestras, prominent professors inmajor music colleges, as well as flute educators in elementary, middle and high schools, private institutes, community centers, etc. KFEA was born as Flute Educators Association (FEA), established in 2008 and grown into an internationally recognized association for flute educators in Korea. FEA has held biannual concerts, special recitals, and seminars regularly for 3 years, and raised international awareness with constant communication through magazine , SNS, YouTube, etc. Also, FEA was recently invited for main program of <2011 WFNT, The World Festival of National Theaters>with 30 qualifying performance teams from 9 different countries as the only classical music association. KFEA will make every effort to become an association encouraging and supporting flute educators, performers, and students. With this in mind, KFEA is going to participate in flute conventions, competitions or camps all over the world and invite the world’s best known musicians or groups to Korea. 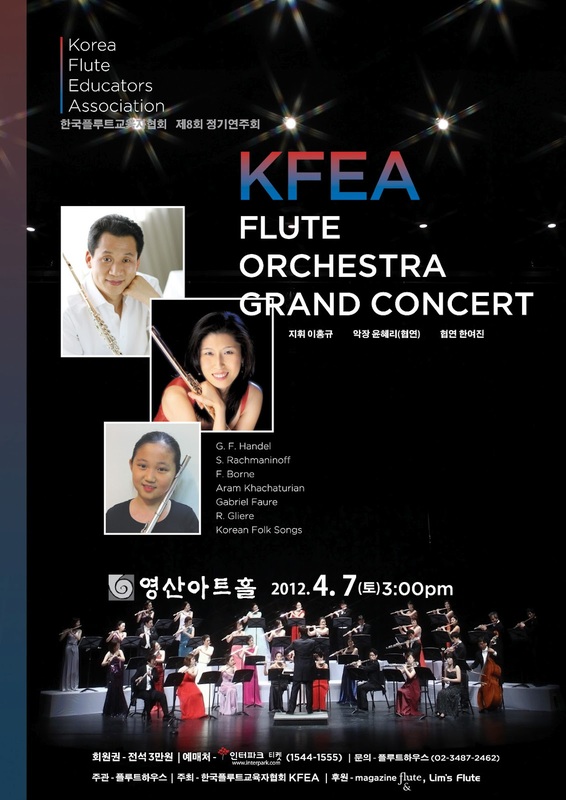 Furthermore, we hope that KFEA will be host tointernational flute conference in Korea. We assure that KFEA is always at the first line to develop flute education culture of the world. The KFEA Flute Orchestra is a representing organization of flautists. The KFEA is an extensive association of leading flautists, and flute instructors in the university and college, the elementary and secondary school, the private music school and the culture center. The KFEA holds academic seminars and studies on flute play and instruction and endeavors to expand network of flautists. Training and education programs to develop skill as flautists and instructors are being given. The KFEA Flute Orchestra is the sole official sponsor of ‘flute&’ the only flute specialized magazine in Korea. The KFEA Flute Orchestra provides a different feeling of harmony from the current orchestra. It endeavors to develop not only classic orchestration, but also to link choir, band and traditional music to the flute orchestra. The flute has extensive sound range from piccolo that goes beyond the highest range of piano with soprano, alto, base and contrabass flutes. The single group of flutes can make an orchestra. 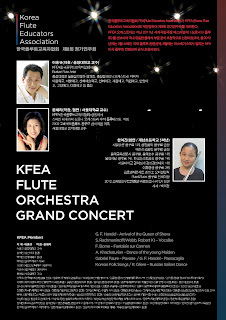 KFEA Concert is designed to spread out the Korean classic and to show the excellence of flute culture in Korea. The flute orchestra is a process to communicate with authentic classic by our audiences and flautists through the modern flute. 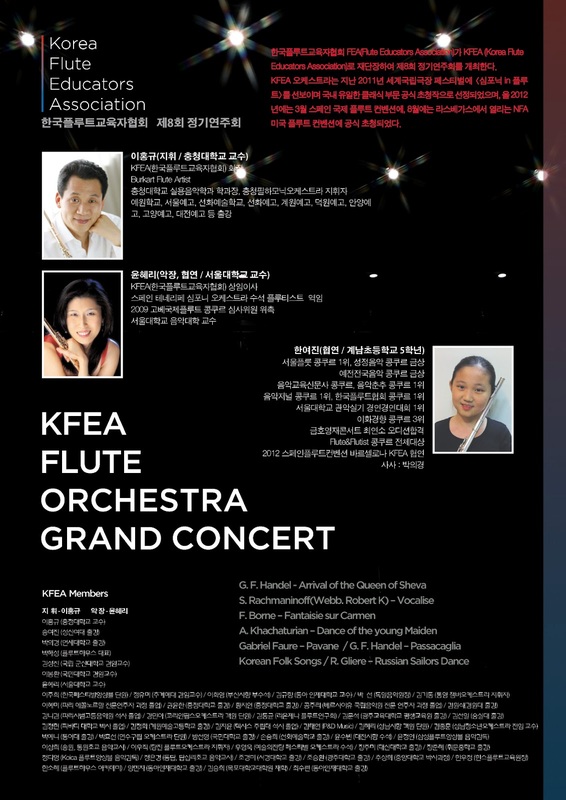 KFEA, as a unique and leading flute orchestra, selected the repertoire from lyrical melodies, dance, and splendid concertos for players and audiences. It shall deliver the feeling of the dreamy flute orchestra.